Nagaland is connected to the rest of India by rail, bus and air services. The closest railway station is at Dimapur, 74 kms away from Kohima , you can get taxi to Kohima in front of the station. The airport is approximately 68 km to Kohima about 2.5 hours drive away. Almost all trains and buses come through Guwahati to Dimapur while some come through Dibrugarh and Jorhat which is also ideal for visits to northern Nagaland. You can also fly to Imphal in Manipur which is approximately 4 hours away by road from Kohima. Imphal is well connected to both Kolkata and Guwahati. There's much more detail below about travelling to Nagaland and the different methods of travel. Travelling by air is by far the quickest way to reach Nagaland and many travellers opt to fly here rather than travelling overland. There are regular flights to and from Dimapur on the border with Assam. Dimapur is the ideal entry point for those travellers who wish to head up to Kohima for the Hornbill festival in December or to visit the area in and around Kohima, perhaps for the WW2 cemetery or the Angami villages of Khonoma, Kigwema and Tuophema. Alternatively, combining air and rail travel by flying to Guwahati in Assam and onwards by rail to Dimapur is a popular option with many visitors to Nagaland. This journey from Guwahati to Dimapur takes around 5 hours. You will need to book tickets at Indian Railways or buy your ticket locally at the station which can be found at Pan Bazaar, Station Rd, Mawhati, Paltan Bazaar, Guwahati, Assam 781001. Travel by bus is also possible and an overnight journey takes around 10 - 12 hours. Tickets can be bought in advance at Network Travels online or again bought locally at Network Travels, 17, GS Road, Paltan Bazaar, Guwahati, Assam 781008. Network Travels phone number is +91 361 260 5335. Flights are operated by all the major domestic airlines including IndiGo, Jet and Air India from Kolkata, Delhi and Mumbai. Travellers who want to visit the Konyak district in the North East of Nagaland, perhaps for the Aoleang festival of the Konyaks around April time, should fly to Dibrugarh on the Assam/Nagaland border. Again flights are operated by all the major domestic airlines including IndiGo, Jet and Air India from Kolkata, Delhi and Mumbai. Another option is to fly to Imphal and then travel onwards to Kohima by road which would take around 4 hrs. Flights, as before, are operated by all the major domestic airlines including IndiGo, Jet and Air India from Kolkata, Delhi and Mumbai. Buses and taxis are available locally. The Nagaland State Transport Bus Station is probably the best option. This can be found at NH39, DM College Campus, Imphal, Manipur 795001. 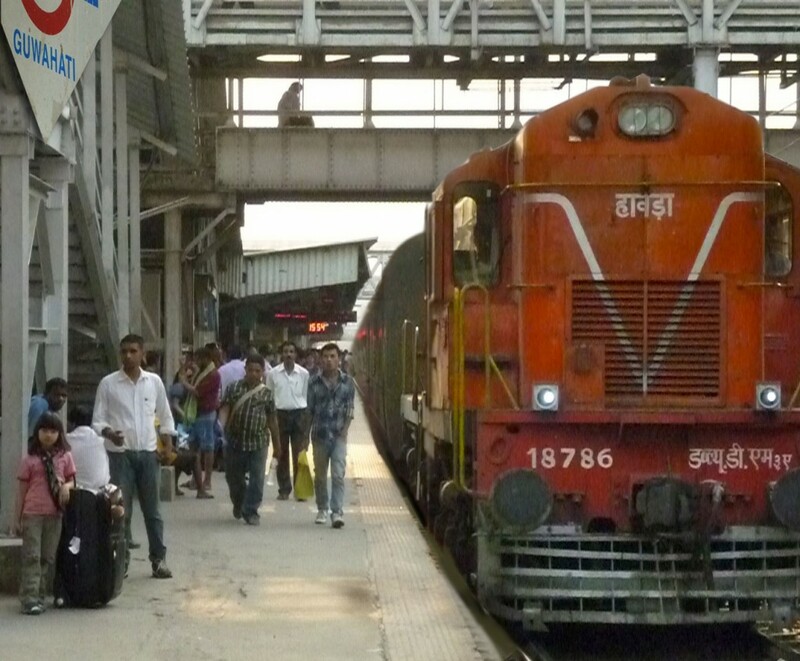 You can travel from Kolkata to Dimapur, in Nagaland by rail. The journey takes around 24 hours or more. Departs HOWRAH JN (HWH) at 5:35 PM and arrives in Dimapur at 9:25 PM next day. A 23hour 08minute journey for (at the time of writing) Rs. 520 upto Rs. 2145. This train continues to Dibrugarh for those wishing to travel to the North of Nagaland. On Wednesdays there are 2 additional direct trains. Departs HOWRAH JN (HWH) at 2:25 PM and arrives in Dimapur at 1:52 PM next day. A 23hour 27minute journey for (at the time of writing) Rs. 540 upto Rs. 2100. Departs KOLKATA (KOAA) 9:40 PM and arrives in Dimapur at 8:48 PM next day. A 23hour 8minute journey for (at the time of writing) Rs. 570 upto Rs. 2145. Alternatively, combining air and rail travel by flying to Guwahati in Assam and onwards by rail to Dimapur is a popular option with many visitors to Nagaland. This journey from Guwahati to Dimapur takes around 5 hours. You will need to book tickets at Indian Railways or buy your ticket locally at the station which can be found at Pan Bazaar, Station Rd, Mawhati, Paltan Bazaar, Guwahati, Assam 781001. Flights are operated by all the major domestic airlines including IndiGo, Jet and Air India from Kolkata, Delhi and Mumbai. Departs GUWAHATI (GHY) - 06:30am, arriving DIMAPUR (DMV) - 10:37am. A journey of only 4 hours 7 mins. This costs (at the time of writing) Rs.140 or Rs. 455. This train continues to Jorhat for those wishing to travel to the North of Nagaland. Note this train does not run on Sundays. Please check with Indian railways for other trains. After reaching Dimapur, either by rail or air, it is possible to get a shared taxi from Dimapur railway station to Kohima (approx Rs 250) or Mon (approx Rs 700). Most taxis to Mon leave early in the morning as the journey is around 10 - 12 hrs. From Kohima it is possible to get shared taxis and local buses to most destination in Nagaland on on-wards to the other North Eastern states. It is becoming increasingly popular to cycle to Nagaland. We have recently hosted guests from the UK who have cycled from London to Singapore and passing through Nagaland and Manipur and then into Myanmar. You can find out more about this on the Cycling Without Borders Facebook site. We've also hosted a motorcyclist on his travels through Nagaland by road, Paul Erdmann from Germany who did B to B - Bangkok to Berlin. His facebook site has more information.